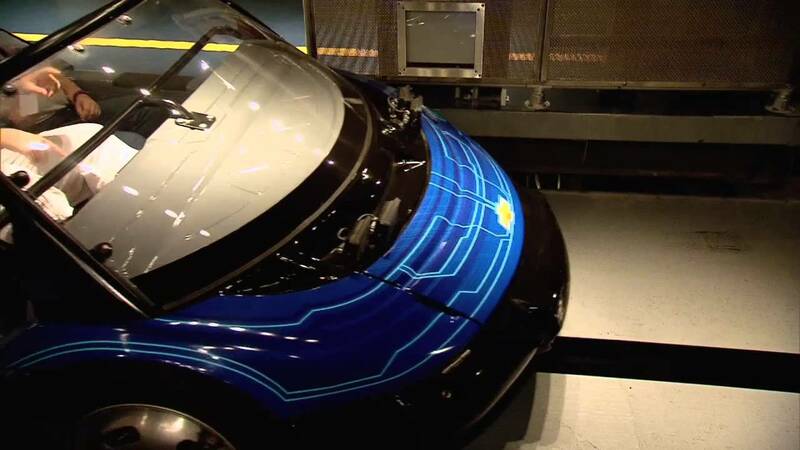 Dec 11, 2012 in "Test Track"
Epcot's Test Track originally opened back in 1999, and at that time represented the cutting edge of Walt Disney Imagineering created ride-systems. As Epcot's first thrill ride, it took guests through a series of vehicle tests and outside onto a 50 degree banked track at highway speeds. The complexity of the ride system caused years of delays to its opening, but ever since the official opening in 1999 it has become a firm favorite and must do for any Walt Disney World visitor. Just over 10 years later, and with a struggling General Motors looking to make more use of one of its most visited marketing locations, plans began to be formulated for a complete makeover of the attraction. After a collaborative design effort between GM and WDI, the original Test Track closed on 16 April 2012 to begin the transformation. 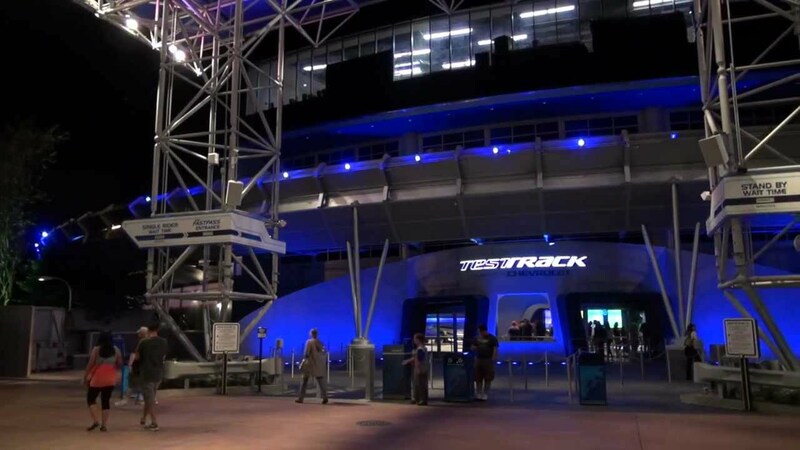 The all new Test Track officially reopened on December 6 2012, with soft openings taking place just a few days before. The first thing that you may notice about the new Test Track is the specific focus on Chevrolet. No more GM Test Track, but instead, Test Track Presented by Chevrolet. This reflects the structural changes to GM as a whole, where a number of their automotive brands were eliminated. Test Track is now all about Chevrolet. Despite having only 8 months to complete the refurbishment, the new Test Track is a massively different experience. Nearly every set piece has been removed from the original attraction, with only the ride system remaining the same. The new Test Track takes a step towards the more traditional Epcot Center pavilion approach, with the idea that there is now more to the pavilion than just the ride. The experience is divided into three very distinct phases. First, guests enter the brand new queue area, which showcases Chevy concept vehicles, and gives guests the chance to take in some inspirational videos about the design process. This queue area is all brand new. Gone are the wide open spaces full of vehicle tests, and in its place come much more structured spaces, winding through the 'Chevrolet Design Center'. It is a sleek space, with modern lighting, curves and lots of eye candy. It is a nice space to be in, with a sense of calm that is very much a departure from what was there before. Worthy of a mention is the new music for Test Track - it has an old school Epcot Center feel to it, and fits so well with the new design. The score on the outside of the building and throughout the queue is a significant improvement over the former Test Track's industrial sounding version. The queue area leads to Chevrolet Design Studio, which is where the first fundamental difference from the old Test Track begins. Guests now get to actually design their own vehicle to be ran on the Test Track. At the design studio pre-show area, guests are split into groups and assigned a design kiosk number. Each kiosk can accommodate up to three guests, in which case all three guests will work on designing a single vehicle. Alternatively, guests can request their own individual kiosk to each create their own vehicle. Following a brief instructional video, the doors to the design studio open, and the fun begins. To get started, the guest touches their RFID equipped card to the kiosk and the design starts. Each kiosk is equipped with a very large touch screen which guides the guest through the process of designing their vehicle. Throughout the process, there are 4 key vehicle parameters that are being tracked - capability, efficiency, responsiveness and power. Each design change you make to your vehicle impacts one of these parameters, and will later be used to measure the final vehicle rating. The time given for the design process varies depending on how busy the attraction is, but it seems that so far there is approximately 5 minutes allocated to the design phase. A timer at the top of the screen tells you how long you have remaining. The design options are extensive, guests can customize the shape, size, color, graphics, engines, spoilers, and much more. Leaving the design studio, guests head to the 'Sim Track.' 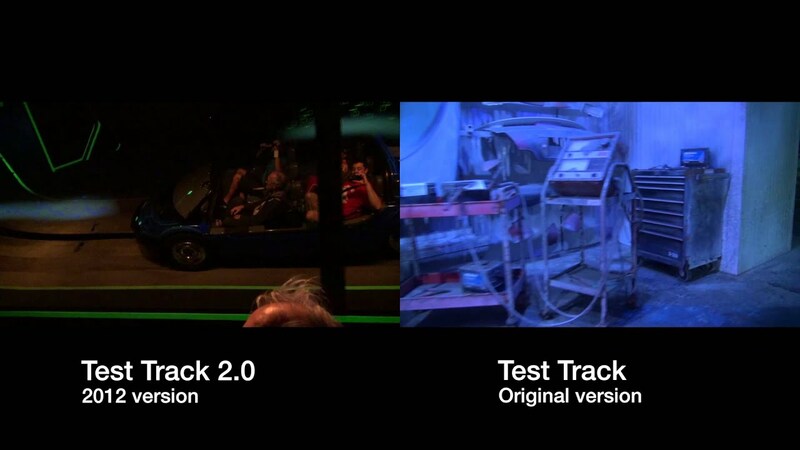 This is the original Test Track ride system, where your freshly designed vehicle will be put through its paces. The loading area has been completely re-built. Barely recognizable from before, it feels very different and looks fresh and new. Operating similarly to before, groups are assigned numbers on the loading area in preparation for boarding. The big difference this time is that the guests now use the RFID card to touch a reader on their boarding spot to associate their custom designed vehicle with the ride. A small screen by each guest confirms the vehicle has been uploaded to the Sim Car. After boarding the ride vehicle, the car moves to the seat belt check. From here it is very clear that things are now very different inside the ride building. Gone are the real-world tests in the warehouse, and in its place comes a very futuristic "Tron" like environment. Taking place mostly in the dark, with vivid lighting effects, the car still goes through the exact same physical track as before, but with all new visuals. The four key parameters that featured in the design phase are now measured by the Sim Car in each of the sections of the Sim Track. At the conclusion of each part of the test, a screen shows each vehicle in the Sim Car, and how it scored in that section of the test. Leaving the Sim Track, guests move into the post show area, where they now have the opportunity to take part in several interactive experiences. First, a huge video screen allows guests to scan their RFID card and see how they stack up against other designers with the performance scores of the vehicles. Next is the opportunity to create a Chevy commercial, featuring the very car that was created in the design studio. A digital driving table allows guests to actually drive a mini version of their car around a track against other guests - again all using the performance characteristics that were designed in the vehicle back in the studio. There are green-screen photo opportunities with Chevy concept vehicles, and also the chance to see a range of current Chevy vehicles in the Chevrolet Showroom. As before, the exit passes through the Test Track gift shop. New Test Track features both standby and FASTPASS lines, including an option for single riders. Standby riders get the full design experience, whereas FASTPASS and single riders get an abbreviated version of the design studio experience, where they are able to select from pre-designed cars, but not have the ability to design from scratch. This new version of Test Track succeeds on a number of levels. It has completely refreshed an aging attraction with an experience that is more engaging than its predecessor. Staying true to the Epcot Center Pavilion concept, you can now spend time in this pavilion, taking in all the pre-show design elements, the actual ride section, and then all the activities of the post-show area. Guests can easily spend a couple of hours in the Test Track attraction, doing more than just standing in a queue. The design studio element is really a clever way of occupying guests while they wait for the ride, but it serves much more purpose than just being a distraction to queue time. Unlike the interactive queue elements of say Space Mountain, the Test Track interactive queue elements stay with you throughout your time in the pavilion, with a role to play in the actual ride and in the post-show. No other attraction really has this degree of continuity and engagement. The new Test Track is a computing powerhouse, and there are still some issues being worked out. During our test rides we have seen a number of design studio kiosks out or action, vehicles not always uploading to the ride vehicles, and problems with vehicle performance data not being displayed during the Sim Track ride section. No doubt these issues are being worked on, but there is certainly a high reliance on computer systems in all aspects of this attraction. There are also a few elements of the attraction that don't quite make sense to some. While the ride section looks great, it does raise a few questions about what is actually going on. Why are we in an electronic "Tron" like environment and why do we then suddenly leave that environment and find ourselves outside in the Epcot parking lot.? The outdoor portion is also strangely silent - no music, no narration, just the sound of the wind. It is quite a jarring transition, and hopefully will receive some attention. If you can look beyond these few points, and accept what is taking place without questioning it, you will more than likely really enjoy the new Test Track. We think that the vast majority of guests are going to rate the new Test Track higher than the original. The design studio element, combined with the improved visuals of the ride section, and the more engaging post show improve the attraction in almost every way. Test Track was massively popular before, and we think it will be even more popular now. Test Track is now officially open, and is operating daily with the rest of Epcot. Check out the video below for a complete walkthrough of the entire experience, along with a side-by-side comparison of the original Test Track and the new Test Track. Scroll down even further for our new Test Track photo gallery.